Experience: Antiques store owner 10+yrs.Best of City Two Years.Collector 56+yrs.USPAP compliant. Member AOA.Founded part of antiques, silver & art collection at local museum. 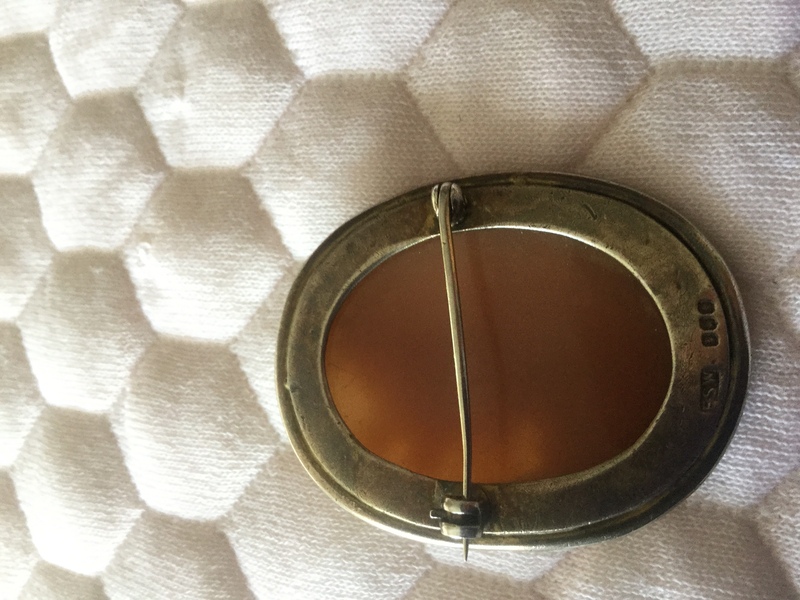 I have a cameo style brooch with what looks like ESW then 3 hallmarks which I can’t make out. What would the ESW mean? Expert: Doris replied 1 year ago. you for your patience.I am reviewing the question. Photos are almost always required to give an accurate assessment. If you cannot send photos, I can still work with your descriptions; however, I can give more accurate answers if I have photos. Please send photos of the item. Please send a photo of the marks and/or words on the bottom. You may need to use the macro function (flower icon) of your camera to get a good clear photo of the marks. If you cannot get a good photo, then sketch the marks and take a photo of the sketch. To send photos you may use the "ADD FILES" in the blue box link (next to "SEND" or "SUBMIT") on your reply page or the "paper clip" found in the toolbar you see on your reply page. Please do not send in ZIP format. The jpg or jpeg format works best. Please do not try to use the site email method of sending photos without specific instructions from me. The stamped marks here are those of the maker ...ESW...the assay office...the sterling lion passant symbol and a date letter for the date of assay. Since there are only four marks and can say that it was made after 1895 because the 5th mark, the duty mark, is no longer required after then. If these were cleaned, we could determine more detailed information. Let me see if I can locate the maker ESW. Please allow time for me to research and type my complete answer. The maker ESW is not listed at present. Still, we know your English brooch is sterling silver made after 1890 and properly assayed (guaranteed Sterling quality). 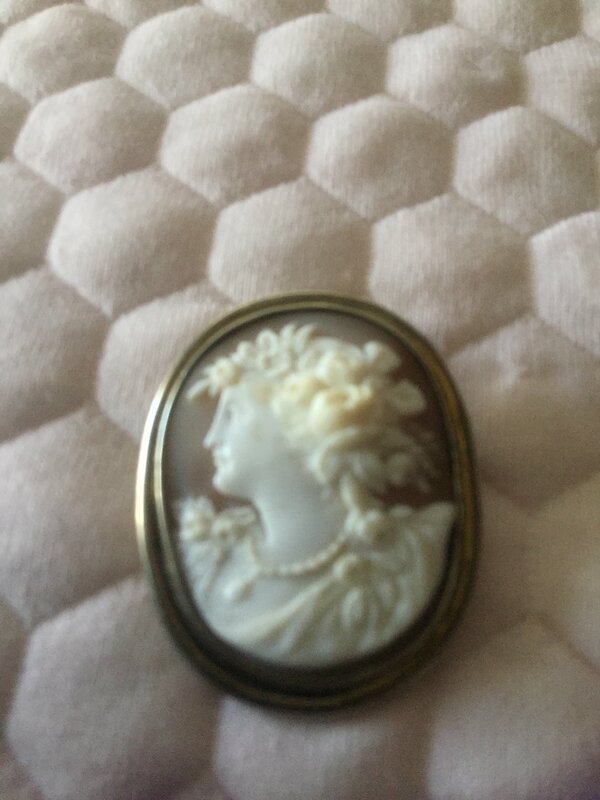 These types of hand carved shell cameos were very popular until about 1920. So we can date it 1890-1920. The estimated retail value is $750-950. Online auctions like eBay generally bring wholesale selling prices. Sales in the eBay "Buy It Now" format are closer to retail. The internet has your largest audience of buyers. Place small ads on these sites or set up your own small store on these sites. Be sure to specify local pick up only for large items. That way the buyer would be responsible for obtaining his own insurance and transport. These sites carry antique as well as vintage items. Etsy.com - small fees-20 cents to list plus 3.5% final price. These sites are excellent and more upscale but fees are higher. I only recommend them if you have several items to sell. Or your nearest CraigsList.com where you can list items for free. Accept cash only. Ultimately, to obtain these retail values we assume the piece or set is in good condition and that the final value depends on sale geographic location. In general, a private seller to a dealer, via consignment or at auction can expect 30-50% of estimated retail value. Insurance replacement values are usually about 20%-50% more than retail values. If I can help you with further questions about this answer, please let me know before you rate me. All my answers are quoted in USA dollars. I endeavor to give realistic, honest answers in a timely manner. Please do not rate me down because of system difficulty. Please let me know if you have difficulty with the site's rating system. To complete this transaction, please click the five stars at the top right of your screen and hit the submit button. Or if you see "review expert" or "rate expert", you can click on that. If you using a mobile phone: scroll to the top of the page then click on Finish Rating, then click on the stars! This allows me to be credited by JA for my Knowledge, Time and Effort. Rating me does not cost you anything extra. Bonuses are not required but are always appreciated. If you would like to use me on any future questions, requesting me expires in a short time. If you type "For Doris Only" as the first of three words of the question, I should be the pro that takes the question. You can also add me as a 'FAVORITE' to your personal expert. I'm just following up with you to see how everything is going. Did my answer help or do you have more questions about your item that would help?